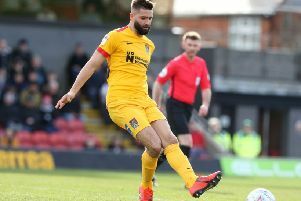 Keith Curle has warned his Cobblers players they will come up against a Cambridge United side ‘fighting for their lives’ at the Abbey Stadium on Saturday (kick-off 3pm). Town make the short trip across the county border to take on Colin Calderwood’s side, who despite an upturn in results in the past few weeks are still very much in the relegation frame. The U’s have won three of their past five games under the former Cobblers boss to ease their fears, including a crucial 1-0 win at rock-bottom Notts County last weekend, but they remain 20th in Sky Bet League Two, just five points above the drop zone. Following their impressive 3-0 win over promotion-chasing Carlisle United last weekend, Town are 16th, but they are only four points better off than Cambridge. And Curle has warned his players to expect a real battle on Saurday. “Cambridge are fighting for their lives,” said the Cobblers boss. “They have had a new manager come in and he will have been looking at his squad and assessing his squad. “He has come in close to the January transfer window and brought in Rushian Hepburn-Murphy. “He is a lad he will have worked with at Aston Villa, and he is a player who is quick, dynamic, has an eye for goal and can stretch a game. “He’ll play alongside Jabo Ibehre, a player I managed to get from London up to Carlisle and spent a very successful period of time with. “I know some of the coaching staff there as well, I worked with Kevin Pikington at Mansfield and Notts County, so I know bits and pieces about the football club and I know bits and pieces about the team. Cobblers will be without injured pair John-Joe O’Toole and Ash Taylor for this weekend. The teams have already met twice this season, drawing 2-2 in the league at the PTS in August, and 1-1 at the Abbey in the Checktrade Trophy in December.